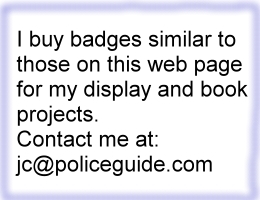 14 K gold presentation badge. Sheriff of Lake County. On October 23, 1873, the Denver City Council passed an ordinance providng for standard uniforms and badges for it's Policemen. The uniforms were to be modeled on those of the New York Metropolitan Police, and paid for by the officers. 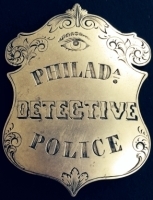 The uniforms were procured at a price of $50.00 per man, and the first Policeman's Ball was held on December 19, 1873. This was done to show off the new uniforms, and to reimburse the cost through ticket sales. Constable of Mesa Co. circa 1880 Grand Junction Colorado. U.S. Forest Service took over and it is now named the Pikes Peak Highway Rangers. More info: The Pikes Peak Highway Patrol was formally organized in June of 1948. Under the supervision of the Colorado Springs City Manager and the Colorado Springs Police Department with supervisory authority given by then Police Chief "Dad" Bruce. The Pikes Peak Highway Patrol has always been a type of "Courtesy Patrol" without any real police authority but strangely, were authorized by our Police Department. Badge 8 is one of the original 15 numbered issues. 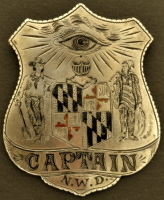 (there is a photograph of the original 15 patrolmen in the archives of the local museum) Later Patrol were issued same style unnumbered badges until the late 60's early 70's when the current style replaced them. Prior to 1948 there is no record of any formal organized patrol on the Pikes Peak Highway.